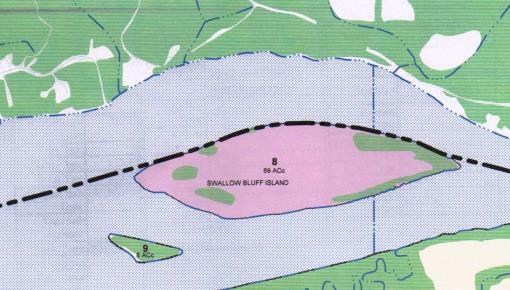 SWALLOW BLUFF ISLAND- PRIVATE ISLAND ON THE TENNESSEE RIVER. Have you ever wanted your own Island to Fish, swim or camp on? This land is in the middle of the Beautiful Tennessee River. At one time they were building a plane runway on the island. There are plenty of trees and you can walk out and swim. There is a public Boat Ramp very close. It is in the area of Saltillo or Dickey Landing. This property is located about 40 miles off Interstate 40, about Â½ way between Nashville and Memphis. The Beautiful Pickwick Lake is close and also Shiloh National Military Park. Also near Savannah which is called the Catfish Capital! Plenty of Fishing, Boating and Water Sports. Savannah is home to Darryl Worley- (Country Music Star), and the Tennessee River Run, which is an annual Country Music Concert benefiting the local Cancer Center and more. The island has building spots. It will need to be looked at by an engineer that can tell you where to build. It is in a 100 Yr flood plain. There can be a home built out of the flood plain on stilts, just like on the homes on the bank of the River. It will take permits from TVA to build, but it has been looked at by an engineer who says it can be done. There are some clear grassy places, but mostly heavy vegetation. Their are goats that live on this island. The nickname for the island is Goat Island. There is a nice sandbar on the end toward the Savannah side where you can swim and have wonderful access to the water. For more information about this property for sale, please call PAIGE TURNBOW at 731-925-7900 or email paigeturnbow@rivercityrealtytn.com to schedule a private showing of this, or any property in our West & Middle Tennessee area. We also serve the North Mississippi area.